Provide an initial version of suggestions for users to have ideas on what to translate. Initial "from" and "to" languages. Especially for first time users we may not have previous language choices info. We can start by a simply using the current wiki language as target language and make a best chance choice based on our stats for source (e.g., English if it is not the target). "From" and "to" selectors need adjustments. For the suggestions view, the language selection should allow to select any language. For the other views (e.g., in progress) it makes sense to show only the options of the current elements in the list, as it is done right now. Showing featured articles. 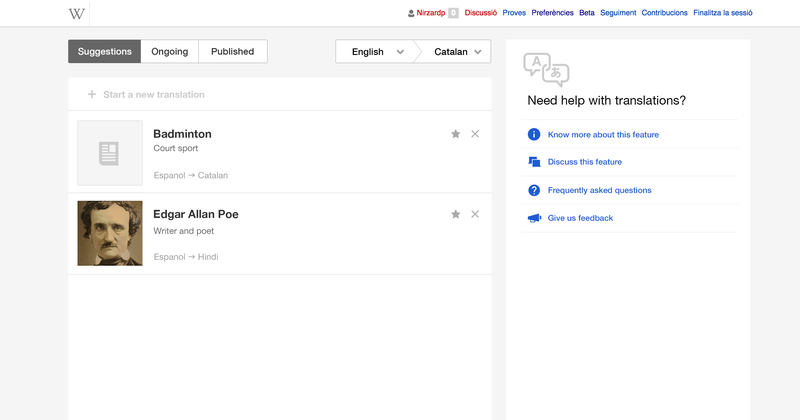 Recommendations will be based on feature articles missing in the target language. Check that suggestions are yet to be translated. 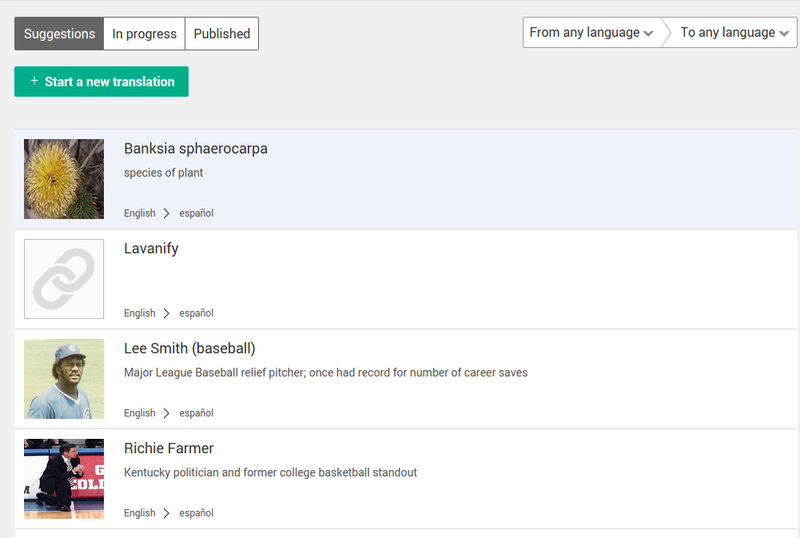 Don't display suggestions for articles that are being translated or they have been already published. Instrumentation. This should be measured as an entry point in the same way we do for other campaigns. Suggestions allow to start translating. When clicking a suggestion the new translation dialog will be opened with all the information pre-filled. 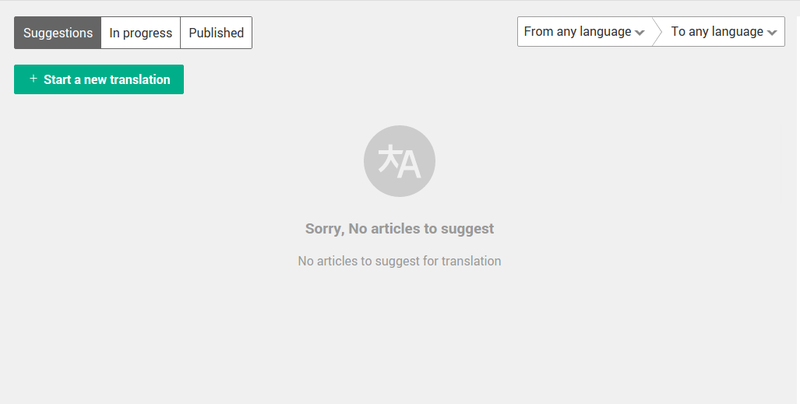 If the translation is started, the suggestion will be removed for the list (and the translation will be shown in the "in progress" section). 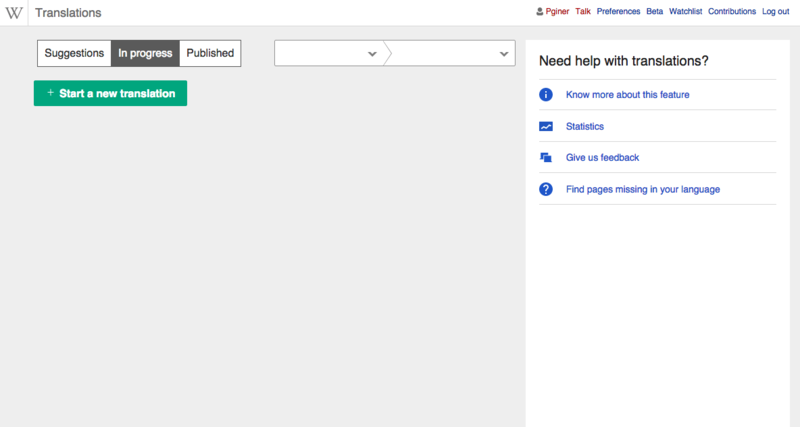 Pginer-WMF added a project: ContentTranslation-Release6. @Pginer-WMF: are you recommending the removal of "star" and "X" to make the first implementation of the dashboard more manageable or is there some other reason for it? It is just to break the feature in minimal atomic parts for it to be developed iteratively. The "star" and "X" are expected to come right after this one. I'll clarify that in the description. Arrbee lowered the priority of this task from High to Normal. Language filter behaviour. In the first screenshot I see the language selector being "any language > any language" if that represents suggestions across any possible languages (e.g, Chinese to Greek, Hindi to Estonian, etc. ), it will be generating suggestions which are of little use for most users. I'd expect that users can select different "from" and "to" languages and provide them a smart initial default (e.g., a user accessing CX through Spanish Wikipedia would get "English > Spanish" suggestions and they can change the source language to "French" if they want to ideas for a French-to-Spanish translation). It may be also useful to provide suggestions for all the languages the user speaks and only those (based on the ones the user has already published articles in). So we may want to provide a "all your languages > all your languages" option, which may not be available for new users without any former translation. The Empty state message. We can convey that the lack of suggestions is temporary, and encourage users to start a translation on their own. Proposed text: "Sorry, no suggestions for now. You can pick any topic of your choice when starting a new translation." You may also want to consider offering Featured article recommendations in only some popular language pairs. This way, you can test the value of such recommendations, without having to worry about a viable set of language pairs from the possible 60K+ pairs you can consider. The reasoning here is that 1) you want to test now, 2) later you want to have more advanced recommendations that won't necessarily recommend any featured article to be translated to all languages (we have the algorithm :). The source language label is a link pointing to source article. It also has a tool tip-view source article. Feature label. Since our initial algorithm only selects featured articles we can use a less prominent style temporally (e.g., green text with no background). That will highlight that the articles are featured but not too much (since all of them are). New translation button. Currently it is competing with the suggestions and disconnected from it. It would be better to connect the button with the list (for all views) and make it quiet-constructive for the suggestions view. More details at T104567. Arrbee moved this task from In Progress to In Review on the LE-CX6-Sprint 4 board. The whole suggestion element should be clickable to start a new suggestion, not only the title. Having the whole element interactive makes it easy to start translating and makes it consistent with (a) the highlight on hover, and (b) the items on other lists such as on-going translations. Smaller styling details: On suggestion items, languages and the "feature" label are not aligned (i.e., sitting on the same baseline). When making the window small, the items in the list break in multiple lines while there is room for them.The padding and size of the language selector needs also some adjustment. Feel free to split into separate tasks if they are not quick fixes worth taking as part of the review process of this one. Currently when reaching the dashboard without existing translations, some items are missing: language selector labels and the empty state message (see mockup below). After switching the views, the empty state message becomes visible but it is not initially. Arrbee moved this task to Done on the LE-CX6-Sprint 4 workboard. Please, before closing make sure to check my comments above and move those that still apply to new tickets. santhosh moved this task from Backlog to QA on the LE-CX7-Sprint 1 board. Resolving this. As far as I can see, the follow-ups are reported separately.